Completion and stimulation technology refer to hardware and methods used to construct wells and improve the fluid production after the physical construction of the well is completed. Completions are described by well design; orientation; areal spacing; and hardware, including liners, casing, methods of diversion, perforating, and cementing. Stimulation technologies include hardware and methods used to pump fluids and materials into the formation to increase contact with the reservoir to improve the rate and recovery of fluids from the formation into the wellbore and, ultimately, to the surface. The North Dakota play is thicker and more widely distributed than the Montana play, allowing for more expansive development. Although horizontal laterals as long as 2 miles have been drilled, data suggest that these wells are only marginally more successful than wells completed at half the length. The majority of wells in most Bakken producing fields utilize multistage fracture treatments. Some operators are attempting over 30 treatment stages within a 10,000-foot lateral. Most wells typically comprise a single lateral completed in the upper Middle Bakken and utilize sliding-sleeve ball-drop systems for openhole multistage (OHMS) stimulation. Alternatively, plug-and-perforate technology has been used in cemented liners and can be used in addition to OHMS to increase multistage fracturing beyond the stage limits of sliding sleeves. Early in the play, some operators chose less costly completion methods that included single-stage fracturing of the entire horizontal wellbore. Although economical, generally, these wells were not as productive as multistage fractured wells. Stimulation, or hydraulic fracturing, is a process used by oil and gas companies to increase production from wells that would otherwise have low production rates and low overall production totals. 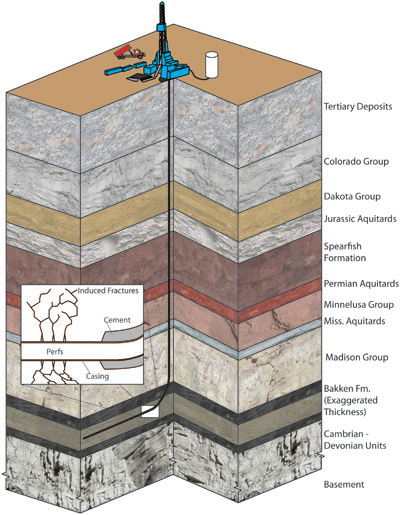 Hydraulic fracturing involves using a pressurized slurry of a fluid, typically water with a solid material referred to as proppant, to fracture or create cracks in the rock emanating from the borehole. This increases the effective conductivity of fluids within the formation and improves the connectivity of the formation to the borehole, allowing improved production of reservoir fluids, including oil or gas.